Legislators (left) attend the Fresno hearing, with water bond panelists (right table, from left) Gary Serrato, Fresno Irrigation District General Manager; Veronica Garibay, Co-Director of the Leadership Council for Justice and Accountability; Joe Del Bosque, California Water Commission member; Mario Santoyo, Friant Water Authority Assistant General Manager; and Jason Peltier, Assistant Manager, Westlands Water District. Potential water bonds lining up for the November ballot continue to get a Legislative shaking out as lawmakers attempt to whittle down a field of some seven proposals. 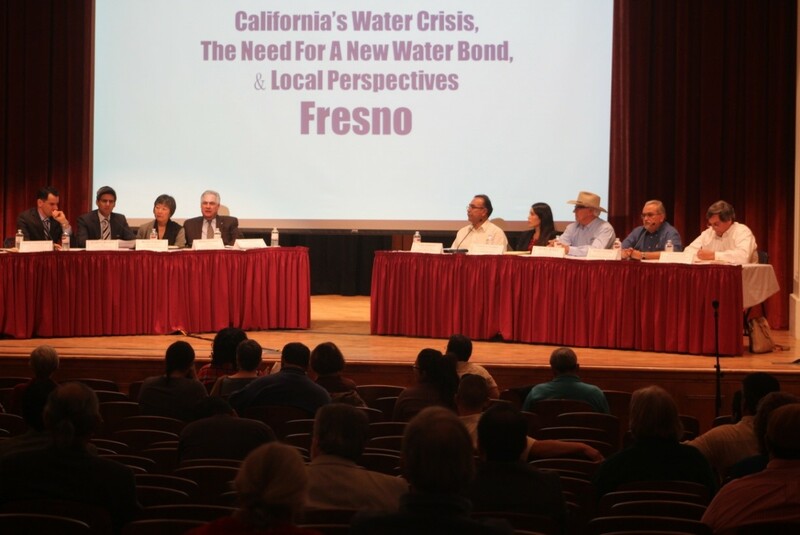 During a February 20 hearing at Fresno City College, several legislators heard calls from valley water leaders on what they contend is a need to frame a new water bond that provides for surface water storage and other much-needed infrastructure solutions for the troubled Delta as well solving the water quality woes plaguing many small disadvantaged valley communities. Friant Water Authority Assistant General Manager Mario Santoyo, who directs the California Latino Water Coalition, said the water bond needs to include $3 billion to put toward surface storage, as was included in the original $11.2 billion water bond that passed the Legislature in 2009. An election on that bond has been twice postponed but is currently scheduled to be on the November ballot if two-thirds of the Legislature can agree on a substitute bill. Assembly Member Anthony Rendon (D-LAKEWOOD), author of a bond bill that would provide $1.5 billion for storage, chaired the Fresno hearing, which was arranged by more broadly based bond proponent, Assembly Member Henry T. Perea (D-FRESNO). Other valley lawmakers taking part included Assembly Members Jim Patterson (R-FRESNO), Adam Gray (D-MERCED), and state Senator Andy Vidak (R-HANFORD). Fresno Irrigation District General Manager Gary Serrato made a big pitch for including the proposed Temperance Flat Reservoir in upper Millerton Lake, saying it would help the entire valley and greatly improve opportunities for capturing and storing excess floodwater when such flows are occurring.